There was a time when names had meaning. A time when people gave their kids certain names because of what the name meant, not just because they thought the name sounded good. In Genesis 17:4-5, God changed Abram's name to Abraham because he would be the father of many, exactly what the name means. In Judges 8, when the people ask Gideon to rule over them, Gideon refuses and says that God will rule over the people. Sounds noble enough, until we get to Judges 9 and find out that the name of his son was Abimelech, which means "my dad is king." Super classy, Gideon. My point is, there was a time when names meant something. The name of God has meaning too. In Exodus 3, when God tells Moses he's sending him to convince the pharaoh to let the Israelites leave Egypt, Moses is concerned that the Israelites will wonder who gave Moses these instructions. 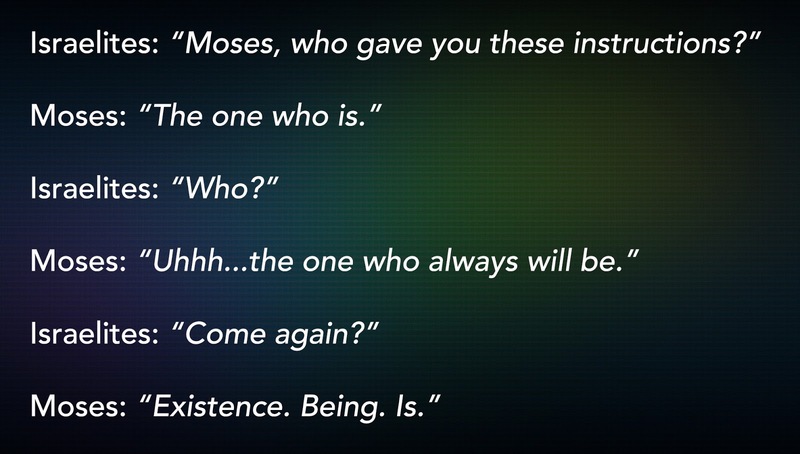 God replies in Exodus 3:14, "I am who I am" (but it can also mean "I will be who I will be"). He goes on in the same verse to instruct Moses to tell the Israelites, "I am (or "I will be") has sent me to you." Now let's think about that for a minute or 20. Kind of heavy, right? But then, as soon as we try to wrap our minds around that, in Exodus 3:15 God says, "Tell the Israelites, 'Yahweh... has sent me to you." This isn't exactly the same answer he gave in the previous verse. It's from the same root word, but he switches from 1st person (I am) to 3rd person (he is). This shouldn't trouble us. 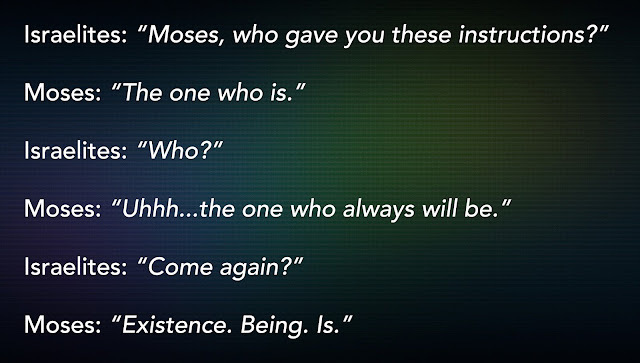 When God introduces himself to Moses, he uses 1st person. When other people are talking about him, they would naturally use 3rd person. There may be something else going on here too. Hebrew does this interesting thing where they add some letters at the beginning of a word to change it from normal to causative (there's more to it than that, but you get the idea). In other words, the verb "to fall" becomes "to cause to fall" (to trip, push, etc.) just by making a few changes at the start of the word. Some have suggested that might be what's going on here, that God's name is a causative form. So God's name may not simply mean "to be" but rather "to cause to be." A pretty good name for the creator of everything. I'm linking to you blog. I'll encourage my readers to post comments and ask you a bunch of questions because I know how much you LOVE interacting with people online. I hope you find the intestinal fortitude to keep writing even when people start talking to you. Ha. Looking forward to it. Thanks for checking it out. I love light reads that are rich in information! Thank you. That's the goal. Thanks for reading. Thank you for giving it your time. Hope you come back for more. Since I am retired I have more time. Considering whether I want to take the time to learn a Biblical Language, probably Greek. Self study seems a possibility, and I have seen websites that look interesting. Are there any you recommend? Honestly, as someone who teaches Hebrew in a mostly traditional class setting, I'm less familiar with the online sources than maybe I should be. I do recommend local private colleges or universities. You can even choose to audit the course at a much lower cost than taking it for credit. Also, depending how close you are to a large city, Jewish community centers often offer beginner courses (in modern Hebrew, rather than biblical Hebrew). Well, I live in Northern Virginia. So there colleges about. I just hate the traffic. I guess there are Jewish community centers, but I had not considered looking one up. Thank you for your suggestions. Perhaps I should more carefully consider what is available locally.